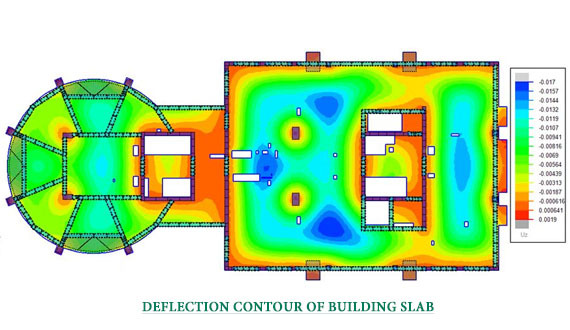 Rashed, Y.F., Boundary element modelling of flat plate floors under vertical loading, Int. J. Numerical Methods in Engineering, 62, 1606-1635, (2005). 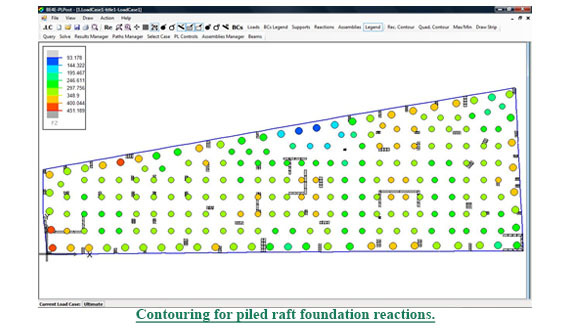 Rashed, Y.F., A boundary/domain element method for analysis of building raft foundations, Engineering Analysis with Boundary Elements, 29, 859-877, (2005). 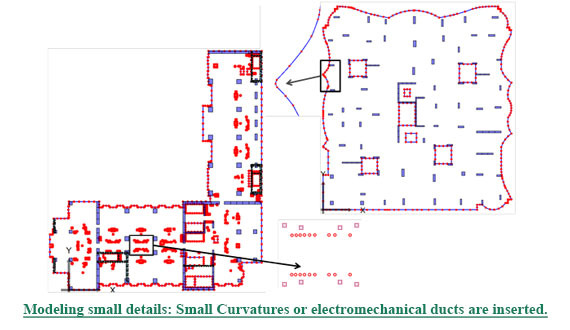 Using the accuracy of the “boundary element method” together with its capabilities in modeling the real geometry to achieve a solution as close to reality as possible. Easy model preparation or model adjustments as well as fast processing. 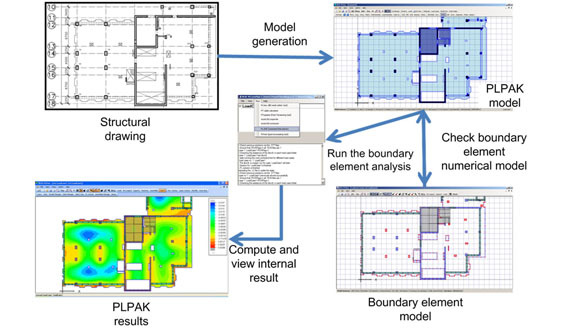 The PLPAK is written in modular form so engineers, researchers, and computational modelers can add their own module and integrate it within the PLPAK. Therefore the PLPAK has no ceiling and its capabilities is open to your thinking and personal inventions. 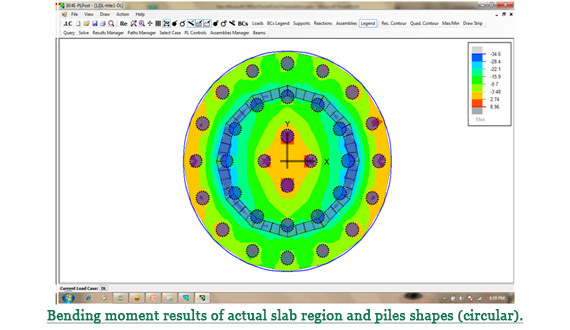 The PLPAK tool can be used as a check program for results that are attained from finite element method programs. 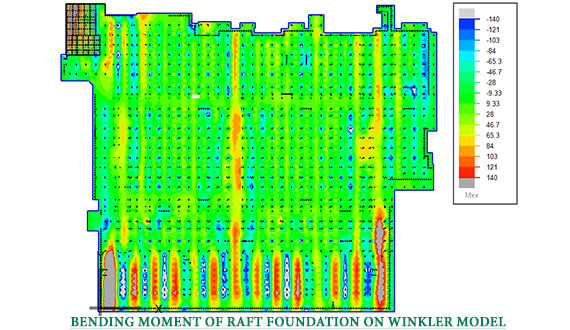 It is recommended in many countries to verify the results of finite element programs through "checking programs", thus the PLPAK is the best solution as it is based on boundary element method. The preprocessor – the PLGen module. 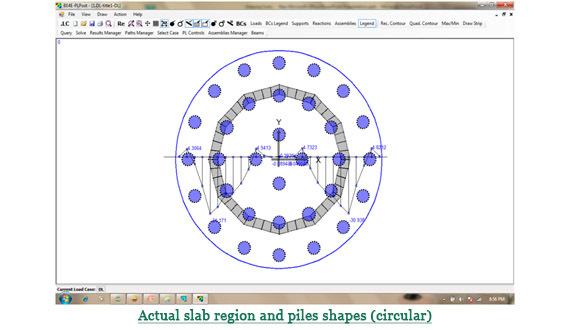 The numerical model (or the boundary element model) viewer – the PLView module. The Core manager – the PLCOREMan module. The command line solver – the PL.EXE. The post-processing – the PLPost module. 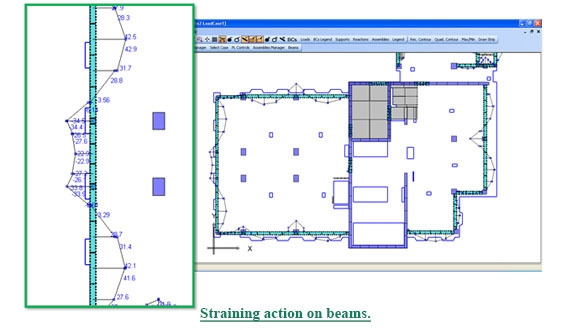 The figures below demonstrate some of the special features only possible through our software. The boundary element method (more accurately known as the boundary integral equation method) is a numerical method to solve challenges in computational mechanics. It actually could be regarded as semi-analytical semi-numerical method rather than being fully numerical method. This guarantees the high precision result. 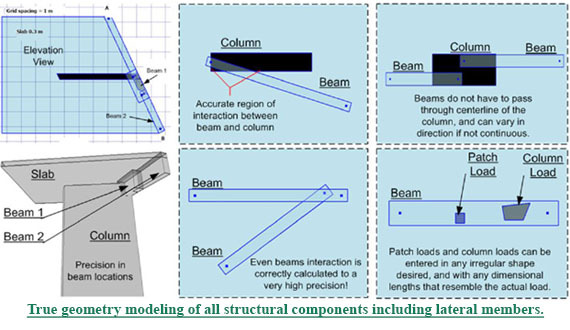 Our main interest is the application of the boundary elements in structural engineering and in particular to plate bending problems. 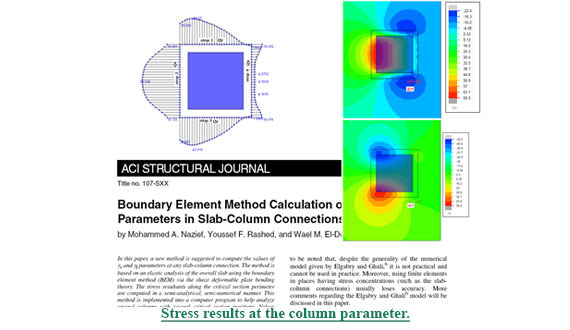 In doing so, Rashed [1,2] had presented two imperative papers in modeling building slabs and foundation plates using the boundary element method. The PLPAK is mainly based on these two publications. 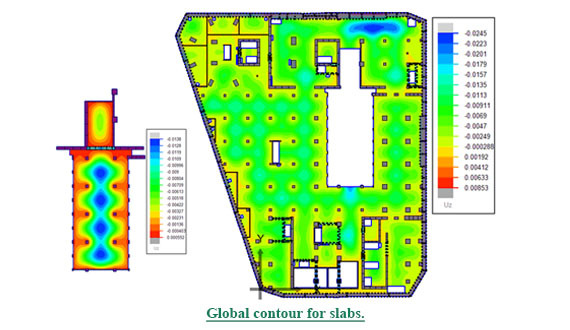 In the boundary element method, the analyzed slab boundary (floor slab or foundation plate) is the only discretized element; i.e., no internal meshing is required. 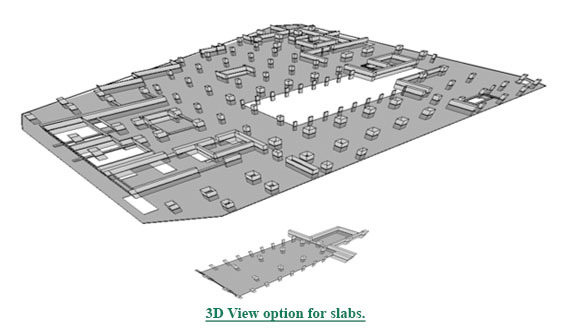 This ensures that the slab is treated as an actual single slab. 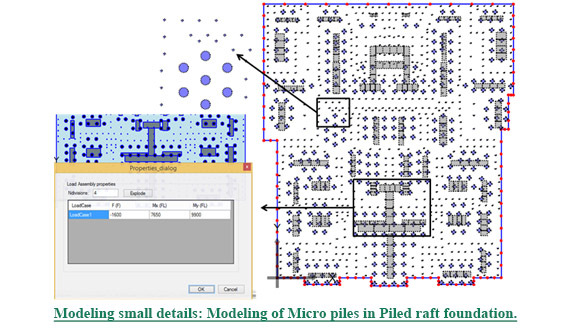 Moreover, easy placement of internal elements is available: such as columns, piles, openings, drops, beam, etc. 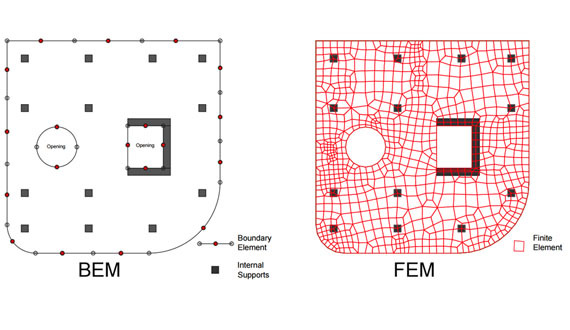 Re-analysis due to architecture changes is very simple (no need for re-meshing). The PLPAK also considers internal supports with their actual geometric shapes. 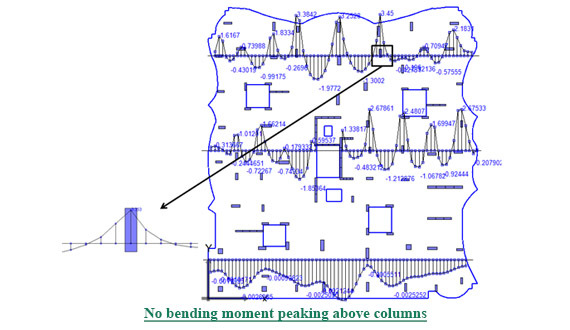 This guarantees no peaking of bending moments over supports and accurate deflection calculations (especially; if we kept in mind the analyzed slab remains a single structure without discretization). 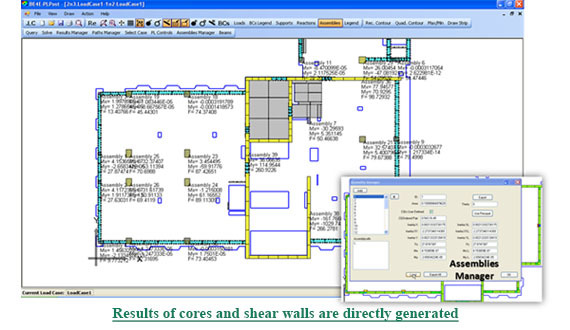 Another vital feature in the PLPAK (or in fact the boundary element method) is all results generated in the post-processing stage are generated in the real-time; i.e. with no interpolation (for including results along strips, or contour maps). This enables achieving results along even the most diminutive of possible areas (1 cm X 1 cm or even less! ).